Despite the push by a teachers association to influence the election of Baltimore County’s newly hybrid elected school board, five candidates prevailed who were not among the six candidates endorsed by the Maryland State Education Association (MSEA) and its local chapter, the Teachers Association of Baltimore County (TABCO). The overwhelming defeat may expose a disconnect between what the associations’ representatives think is best and what voters value in school board candidates. And the MSEA put significant money behind its chosen candidates while asking association members to vote for them. Campaign finance records, studied by The Baltimore Post, reveal that the MSEA donated $17,821.66 to the campaigns of five of its six chosen school board candidates. 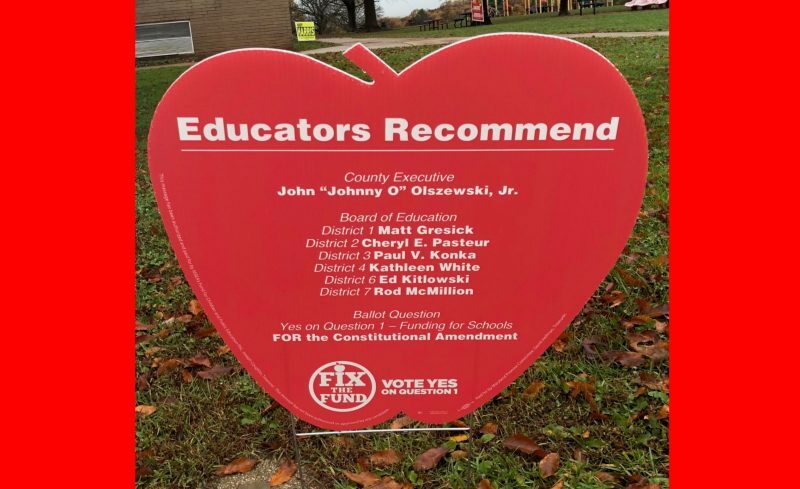 The MSEA and TABCO also provided their suggested candidates on an “Apple Ballot.” The ballot serves as candidate recommendations to TABCO’s 9,000 Baltimore County education members. But despite the financial backing and endorsements, voters overwhelmingly selected school board candidates not endorsed by either association. Instead, voters chose Lisa Mack (District One), Kathleen Causey (District Three), Makeda Scott (District Four), Julie Henn (District Five) and Lily Rowe (District Six) to represent their respective councilmanic districts for Baltimore County’s first ever hybrid elected school board. For the first time this midterm, voters were able to cast their votes for seven members of the 12-member school board who represent the seven councilmanic districts. The four remaining members will be appointed by Governor Larry Hogan after an election committee submits candidates for his review. The student member, Haleemat Adekoya, was appointed in July. Most notable when votes were counted after Tuesday’s election was the landslide victory of incumbent board member, Kathleen Causey, against adjunct professor and Baltimore County substitute teacher, Paul Konka. Causey, who was appointed by Gov. Hogan in 2015 to represent District Three, won by over 75 percent of the votes on Tuesday. The MSEA invested $6,500 into Konka’s campaign against Causey. Yet while Konka received 9,556 votes, Causey brought in 30,161. Longtime education advocate, Lily Rowe, also prevailed, bringing in 60.6 percent of the vote from District Six. But while Rowe did not receive the endorsement nor financial support from the MSEA or TABCO, her opponent, Edward Kitlowski, did. Kitlowski, an educator who was also a student of Baltimore County Public Schools, received $6,155.16 from the MSEA and a spot on the association’s Apple Ballot. District One candidate and Howard County teacher, Matt Gresick, received the next highest amount in contributions from the MSEA. The association invested $ 3,166.50 in his campaign, while he received 39.8 percent of the votes. Lisa Mack, a former Verizon executive, adjunct professor and longtime child advocate, won with 59.6 percent of the votes for the district, and did not receive any financial support from the association. Victorious District Seven candidate, Rod McMillion, was the only MSBE-backed school board candidate to also receive financial support from the MSEA and win his election. McMillion received $1,250 in donations from the MSBE. The Baltimore County school teacher won with 55.5 percent of the votes against opponent, William Feuer. McMillion will retire from his employment with school system in order to serve on the school board. Former FBI agent and Baltimore County school principal, Cheryl Pastuer, also won the endorsement of the MSEA — and her election. Pastuer defeated Anthony Glasser with 65.9 of the votes. But unlike the others, Pastuer was the only candidate endorsed by MSEA and TABCO who did not report a single contribution from the associations. Pastuer will represent District Two. District Four candidate, Kathleen White, PhD., received $750 from the association that also endorsed her. She was defeated by Makeda Scott, who beat White with more than 3,500 votes, taking up 54.2 percent of the 38,239 votes cast in the district. But while incumbent school board member, Julie Henn, won her District Five seat unopposed, she did not receive an endorsement from the MSEA. Henn’s opponent, Peter Beilenson, dropped out of the race in July after accepting an out-of-state job. But rather than support the only remaining candidate in the district, TABCO and the MSEA’s Apple Ballot simply omitted District Five, altogether. Henn was appointed by Gov. Larry Hogan in December 2016 as an at large member of the board. Despite the election results, MSEA’s local association, TABCO, says it is ready to work with the newly elected school board members. Although the new board will not be seated until December, TABCO President Abby Beytin congratulated the winners at Thursday’s board meeting. And Beytin is already looking ahead to the future. The new school board will meet for its first open session board meeting on December 11.